My first introduction to quinoa was about two years ago. Until then I just heard all good hype about this whole grain which is actually not a grain. 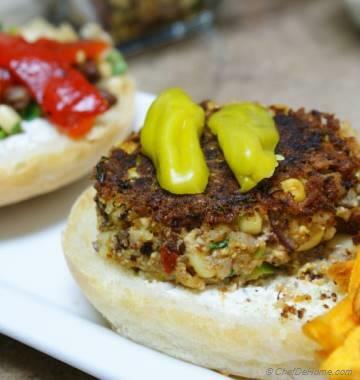 I first tasted quinoa in a vegan restaurant where I enjoyed a delicious gluten-free quinoa burger. I am hooked to quinoa since then. 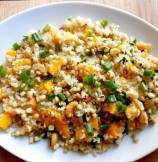 This light and nutty quinoa salad has sweetness from mangoes and roasted corn and fresh tang from lemon juice and zest. 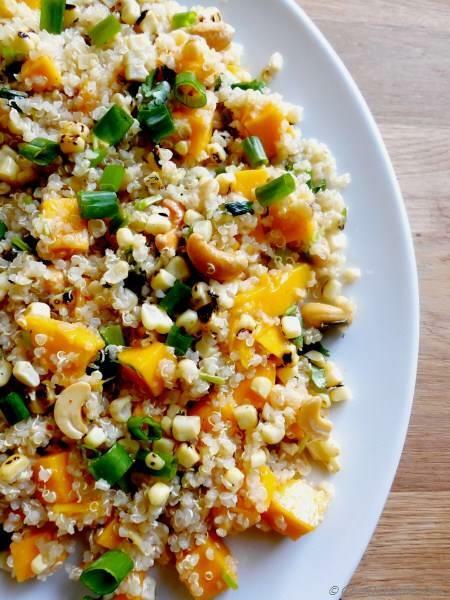 In every bite you will experience sweet mango, smoky corn, nutty quinoa and cashews, super addictive. This is kind of salad where you will keep going for more every time you empty the plate. Recipe serves two but since it was so addictive, next time I am going to make at least 2 serving each for two of us. In my salads, I generally keep grain and veggies in ration 1:1. But, it will be totally ok if you just double the amount of quinoa with same quantity of veggies to make 4 servings or filling salad for dinner for two. Just adjust the seasoning per taste. 1. To make the quinoa, bring 1 and 1/2 cup water to rolling boil (you can also use low-sodium vegetable broth instead of water, skip salt if using broth). Add 1/2 tsp salt and stir well. Now add Quinoa, bring to simmer, then reduce the heat to cook gently for 15-20 minutes (until quinoa is tender but not mushy) liquid is absorbed. 2. 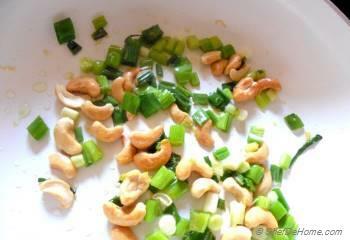 Heat 1 tbsp oil in a medium size saucepan, add all scallions (leave 2 tbsp for garnish) and cook for about 2 minutes. 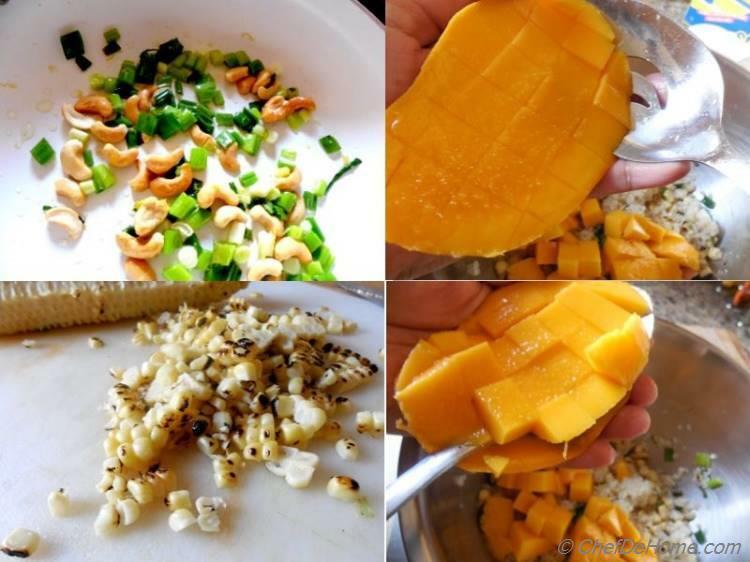 Add cashew and continue saute for 2 more minutes (cashews will be slightly brown and crispy by now). Mix in lemon zest and juice. Season with salt and pepper per taste. Remove from heat and set aside. 3. Roast the corn on cob on open stove flame till you see blisters all over the corn and room is filled with roasted corn aroma. If you like, you can also steam or grill the corn instead of roasting. 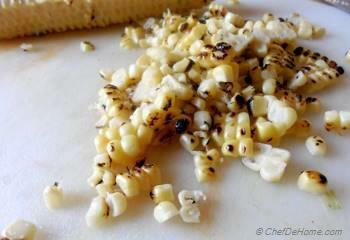 Remove kernels from cob and set aside to cool down. 4. 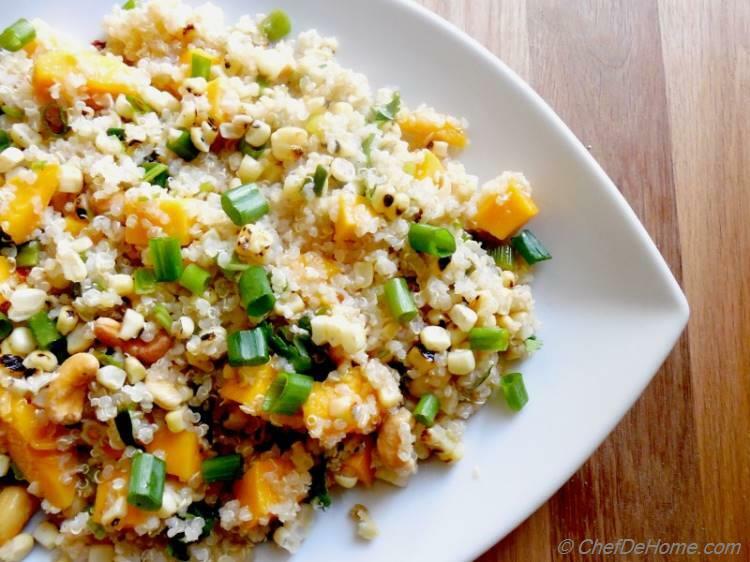 In a large salad, bowl, add scallions mixture, quinoa, roasted corn and diced mango. Combine gently with spatula. 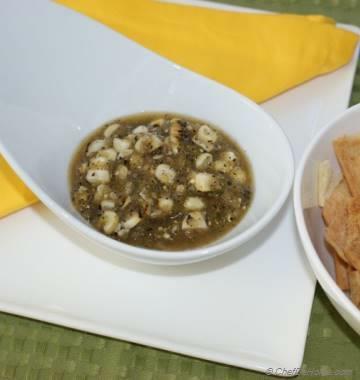 Transfer to a serving platter and serve warm or chill for 20 minutes before serving. 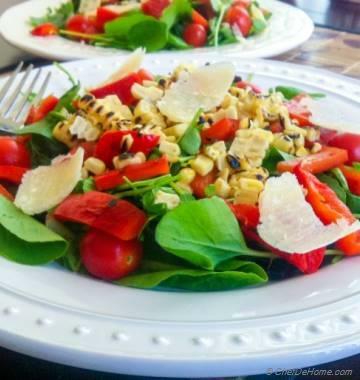 Enjoy a simple yet filling, sweet and nutty salad.